As many of you already know, I’m a huge fan of watching classic/period drama. One of my absolute favourites is Andrew Davies’ adaptation of Tolstoy’s War and Peace, aired by BBC in January 2016 (directed by Tom Harper). Starring Lily James, Paul Dano and James Norton, it follows the fortunes and the rise and fall of five aristocratic families in the diminishing days of Imperial Russia. The ‘love story’ between Countess Natalya “Natasha” Ilyinichna Rostova and Prince “Andrei” Nikolayevich Bolkonsky is just one of the many captivating narratives told in one of the greatest novels of all time. Davies, as usual, portrayed everything enchantingly. He really is a genuis! 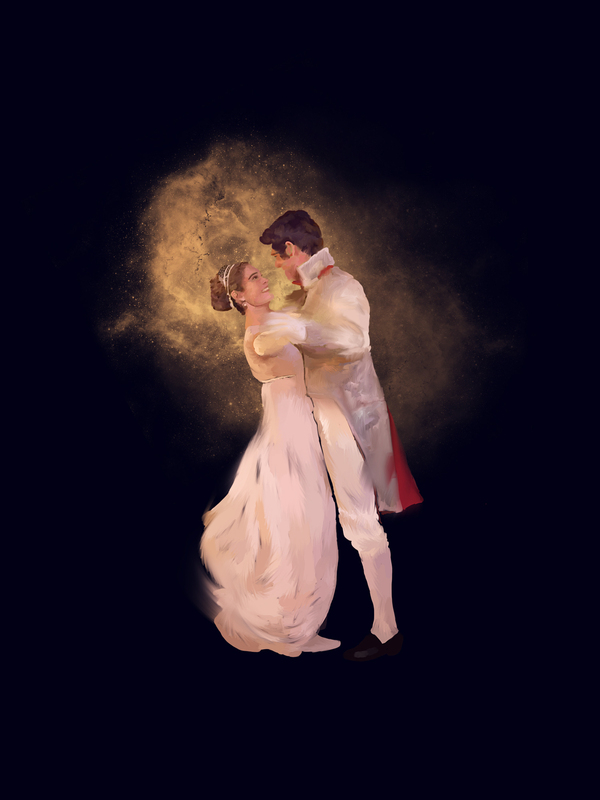 As for me, I like to illustrate whatever takes my fancy some evenings and this time it was Natasha and Andrei’s intimate ballroom dance from the third episode. Find yo ‘self someone who looks at you the way Natasha looks at Andrei!! On a final note, the soundtrack by Martin Phipps is brilliance itself.